This is a phenomenal Whitetail Deer taxidermy shoulder mount, posed in an upright position looking to the viewer's left out into the room. What makes this buck unique is the split brow tines. The brow tines are the first tines starting from the base of the antler. The 14 total points help earn this an SCI Gold Medal with a score of 167 4/8". The hide and hair on this buck both in perfect condition. The craftsmanship and taxidermy work are both masterful! 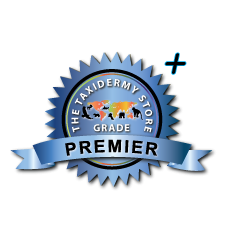 All of this has combined to earn this item our Premier Plus™ overall quality rating. All applicable measurements and dimensions are provided to help ensure this item will fit within your intended space, as well as meet expectations regarding the item's featured attribute sizes, scores, etc.